We are still waiting. We have been waiting for over a year to see the real Donald Trump. The one who will become more controlled, more disciplined, more willing to listen and learn, less bombastic, less impulsive, less needy, less self-serving, more cautious, less self-centered and more “presidential”. We have been informed on a number of occasions that the reset is about to happen. We are still waiting. Despite all predictions, prognostications and fears, Donald Trump was elected to the Presidency of the United States just over 3 weeks ago. Yet even after his victory we are still waiting for that, always just around the corner, reset. His constant compulsion to tweet rants unbounded by careful consideration or concern about impact is a clear indication of the fact that Donald Trump today is the same as he was some 18 months ago when he began his campaign. The fact is that what you see is what we got. So what is it that we have? Over the past three weeks a number of things have become clear. Obviously, Donald Trump cares little for precedent or the wisdom born of experience. He clearly has complete and unwavering trust in his own opinion. While he will listen to others, he will confidently keep his own counsel. While this might be viewed as a strength for a national leader, in his case, his lack of knowledge and experience make it a weakness and, in fact, a danger to our national security. Additionally, his choices for key cabinet and staff positions give us cause for concern. Based on those choices his campaign bluster will turn into national policy in his administration. The records and words of those officials in key positions should give pause to anyone who cares about the progress that has been made in all areas of civil and legal rights. We should be concerned equally about the future of our nation in areas such as trade, climate change and alliance building. Additionally, Trump’s refusal to acknowledge the incredibly serious potential for conflicts of interest, given his holding and business entanglements around the world, will create diplomatic and legal havoc. Certainly, this should be of great concern to all of us. Yet, there have been statements made by the President-elect that are cause for alarm. 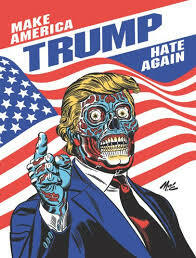 Throughout the campaign his pronouncements regarding Muslim entry into the US, his promise to deport Latinos and his rants against the press were hoped to be just campaign rhetoric designed to rally his supporters. The apparent disregard for Constitutional guarantees was hoped to be just rhetorical red meat. Yet, despite his victory, Trump has continued to lambast the press, discuss limiting US entry of individuals from “certain” countries and discuss the need to deport millions of the undocumented Latino community. Just the other day he tweeted that flag burning, determined to be legal by the Supreme Court, should be punishable by a year in jail and loss of citizenship. In his business practices Trump has viewed the law as something to be used, not adhered to. His lack of respect for precedent and the rule of law are perhaps the most dangerous attitudes he has displayed. His appointments of Sessions, Flynn and Bannon raise significant questions regarding the manner in which our basic rights will be protected. As noted above, his attempt to continually intimidate the press and rant about their dishonesty in order to discredit them is extremely dangerous. A free and independent press is a basic foundation of democracy. Those who are still waiting for Trump to moderate his rhetoric or control his behavior are going to be sorely disappointed. He will not change. This will become clear as he goes on his victory tour next week and once again goes into a mutual feeding frenzy with the crowd. We can’t hope for what we know in our heart of hearts will never be. We must be prepared to react and act as required by the situation. Trump obviously has authoritarian tendencies. This is not a time to be passive and just hope for the best.